#1 NEW YORK TIMES BESTSELLER hailed by TIME magazine as the best nonfiction book of the year. 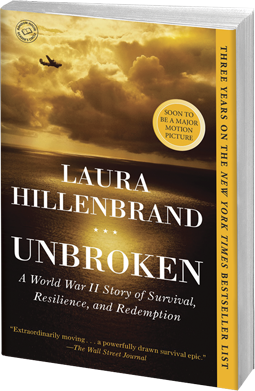 One of the longest-running New York Times bestsellers of all time, Unbroken spent more than four years on the Times list in hardcover, fifteen weeks at number one. Released in paperback, Unbroken debuted at #1 and remained there for dozens of weeks. The book is the winner of the Los Angeles Times Book of the Year Award for Biography. The young reader edition, released in November, 2014, is also a New York Times bestseller. Click to hear an excerpt from the audio book.